On this last Monday in February I am joining Cathy’s In A Vase On Monday challenge to arrange a container from plant materials found in one’s garden. Today’s vase includes the first daffodils of the season. These opened in my garden on February 21 and I cut them to bring indoors yesterday. Last year many daffodils were blooming on January 30, 2013, a full three weeks earlier. We had a warm, sunny weekend with temperatures in the high 60sF so more daffodils may be encourage to open this week. Helleborus x hybridus (Lenten rose) are in full bloom now and yesterday I took time to remove their large leaves so the flowers can be enjoyed more easily. There are lots of seedlings that have volunteered that I can use to make new hellebores plantings and share with friends. A simple glass vase holds today’s colorful flowers, which seem to need little more enhancement. I photographed the arrangement by the window where the cut glass lamp played with the light. A favorite dove sculpture that had belonged to my father-in-law completes the setting. My husband’s father died before my husband and I met, so I know little about him, but I admire his little white dove. He apparently subscribed to an art club that worked in the way many book clubs do—a sculpture of the month, I guess! This is the only example remaining from his collecting days that I know. It was fun to play with his dove and the flowers today. Thanks very much to Cathy at Rambling In The Garden for hosting. Visit her site to see her arrangement this week and see what other participants are placing In A Vase On Monday. This entry was posted in garden and tagged daffodil, flower arranging, flower design, helleborus, in a vase on monday, nature photography on February 24, 2014 by pbmgarden. Love your dove sculpture, beautiful in its simplicity and of course I love your flowers too! The hellebores and narcissus are bringing much needed colour into the garden these days, spring must be just around the corner! The simplicity of the dove is what I like too–perfect in its form. Color is late coming to my garden this year so I’ve been enjoying spring through your posts Pauline, but now I am beginning to notice more signs here. A charming arrangement. It looks so fresh and spring-like. Which Narcissus is it? Thank you Chloris. I think it is Narcissus ‘King Alfred’, but am no longer sure. You wouldn’t imagine that pink and yellow would look good together but they do! Really fresh and spring like. Cathy said her Hellebores don’t last long in water, I’d be interested to know how long yours last. I laughed when I saw your comment because if you had asked me if I would pair yellow and pink flowers together I would have said absolutely not! But here they are and it turns out several weeks ago the flowers I was working with were also pink and yellow. I have seen several mentions that Hellebores don’t last long in water but I have kept them for 7-10 days, doing nothing special than to refresh the water. Lovely Susie! A taste of spring! The dove goes well with a spring arrangement. 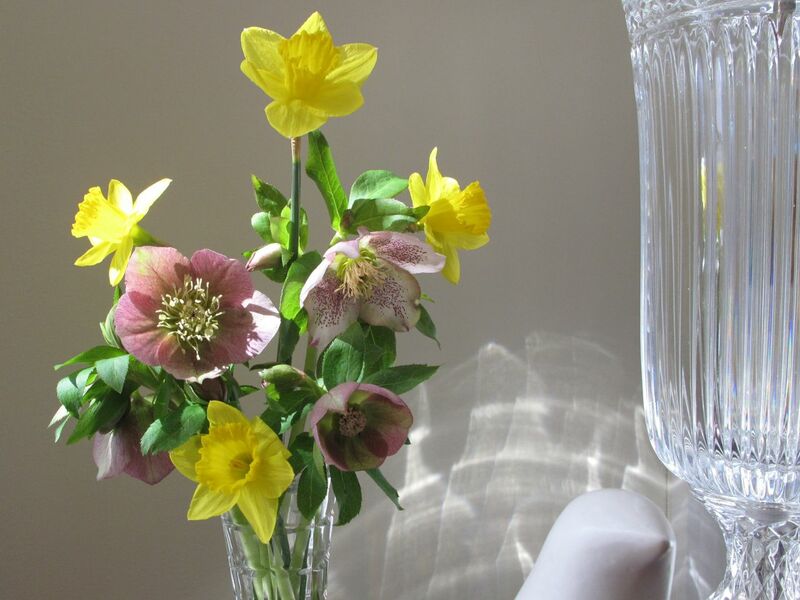 My hellebores are just opening, and I will follow your example and cut a few for indoors. The flowers are otherwise so hard to see as they tend to droop downwards. Can’t wait to see daffodils here too. We need just a little longer, but spring is certainly on the way here as well! Oh, how lovely. Thanks for sharing. On a Sunny Monday morning in Nashville, NC, I wish I had your vase here. A dove….oh, how the world needs peace today. Thanks Stepheny. Wish I could bring you some blossoms right over! Thanks for your comments Annette. The dove sits on that table near the window, so it seemed natural to include it. I’m going to look up guinea fowl to check out the pattern. The daffodil may be Narcissus ‘King Alfred’. Pure and simple – and the dove evokes that pureness too. Exquisite! There is no such thing as a ‘duff’ hellebore, is there? They are all beautiful with their individuals details. The light really enhances the arrangement – as Annette says, the reflection adds to it (unlike the reflections I was trying to avoid with mine!). Thanks so much for joining in. Thank you Cathy. 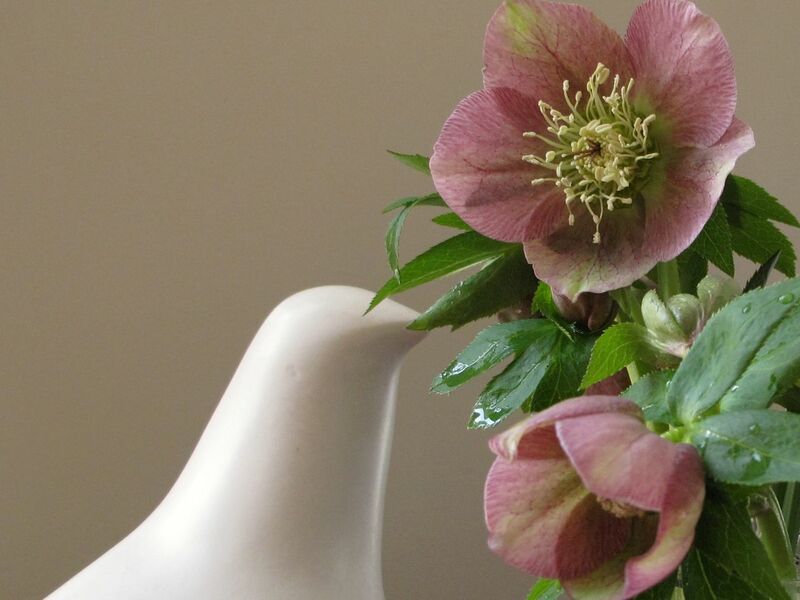 I agree–all hellebores seem to have complex color and patterns. It’s more fun to photograph in daylight, much better options. And thanks again to you for hosting! simple, yet Beautiful! I can’t wait until we start having the flowers bloom! I appreciate that Michael. Hope your flowers are about to pop soon too. Thought maybe you’d be ahead of here but guess you are at a higher elevation. A beautiful arrangement beautifully photographed – I love the way you have captured the light in the photos! It is funny that your daffodils are 3 weeks late and mine are 3 weeks earlier than last year. 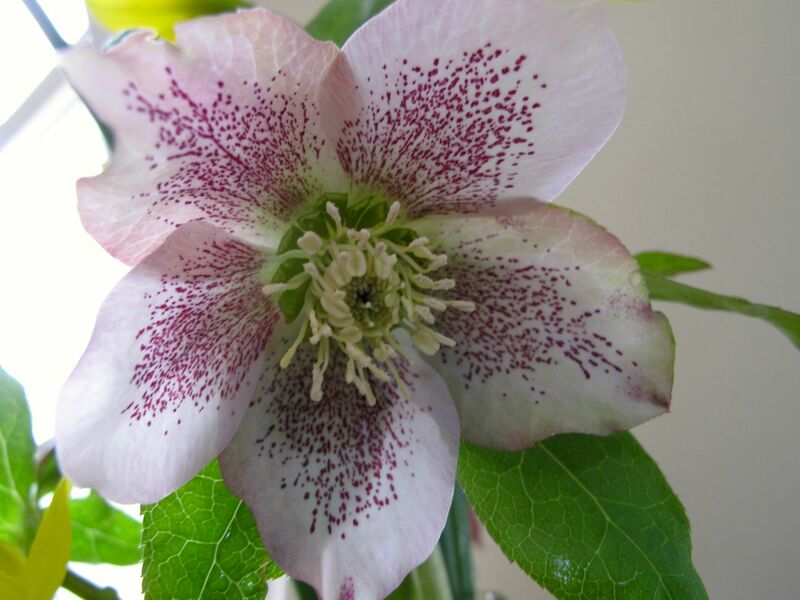 The hellebores seen unaffected by the weather – flowering to the same timetable regardless of the temperature. It is lovely to see the two together in a vase. Thanks very much Julie. My hellebores were a bit late too by a week or two, can’t quite remember now. They amaze me. Thanks–it’s so nice to have something blooming again to play with. 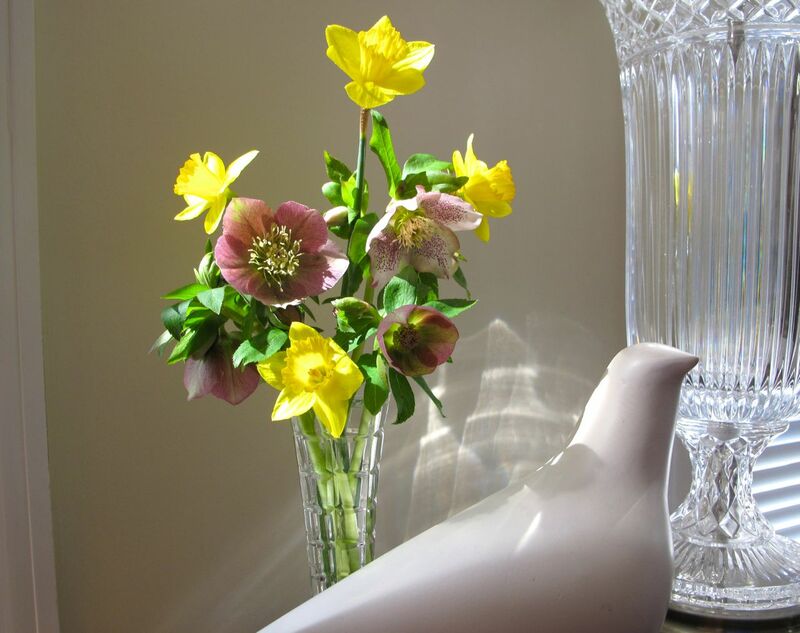 The crystal looks just right with the flowers and dove…love the play of light. Thanks Marian. I find it hard to photograph flower arrangements and this was no exception, but having the light to work with was fun. Have a good day. So lovely! The bright yellow is wonderful to look at during these grey days. Thanks. 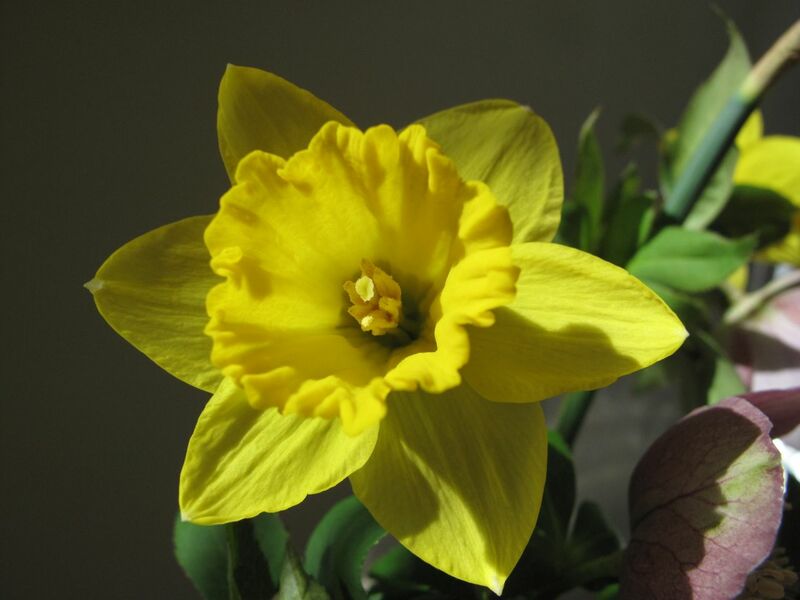 The daffodil yellow is a good remedy to help pull us out of the dark winter slump. Thanks–I will look up the poem. The prismatic effect of the cut glass lamp often gives us presents of colorful light against the wall. Beauty and simplicity in a single vase of flowers, how gorgeous! Thanks very much. The flowers spoke for themselves in this arrangement–I was just glad to be there!